These Plastic Cup Diaphragms help prevent paint from entering the spray gun through the pressure tube. Tough and durable, the diaphragms should last months (if not years) if care is taken sliding them down the metal fluid tube. To remove them from the cup, grab the tab. The air hole in the diaphragm should be positioned at the rear of the cup (towards the handle). That is, unless you intend spraying upwards for any length of time. For spraying upwards, position the hole in the diaphragm towards the front of the spray gun. The idea is to keep the hole out of the paint as much as possible. 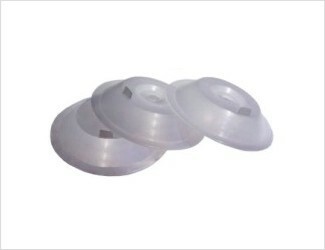 These diaphragms, in combination with the pressure tube/check valve, cure the problem of paint backing up the pressure tube. The diaphragm must be used with a gasket.